Last week, I had a rare dinner out with friends. The conversation turned gloomy; it had been an awful news week. Another school shooting, with ten dead. A school bus crash in which a student and teacher had died. A plane crash in Cuba, with 100 dead. A mother had jumped off a rooftop in Manhattan, her seven-year-old son in her arms. Thankfully, there was butterfly therapy at home; we'd gotten an Insect Lore Butterfly Garden. 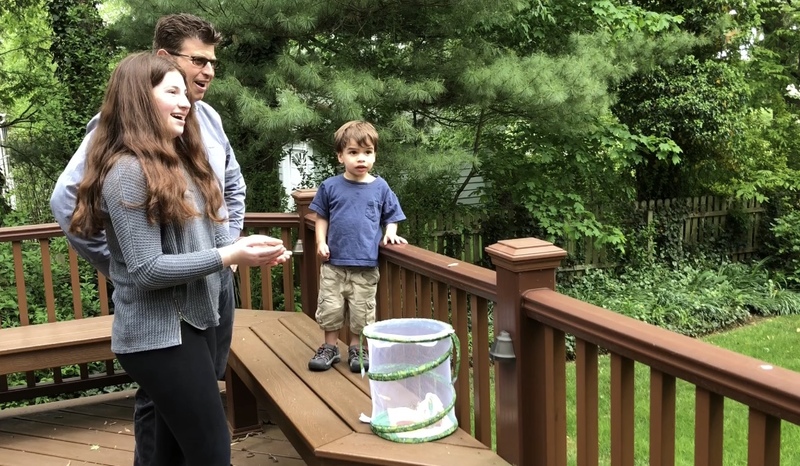 We mailed in the voucher for a cup of caterpillars, watched them grow big and fat off the food in the cup and turn into chrysalises; watched those for a week and a half and wondered if we'd somehow killed them all. And then all last week, we'd wake up to find yet another Painted Lady had emerged. There were four. All of us were fascinated by the display of nature right there on our kitchen counter. Max named one butterfly Ben, although we we couldn't be sure which one. Ben named one Ben, although we couldn't be sure which one. We watched them flit around the netted habit and drink sugar water out of the feeder. 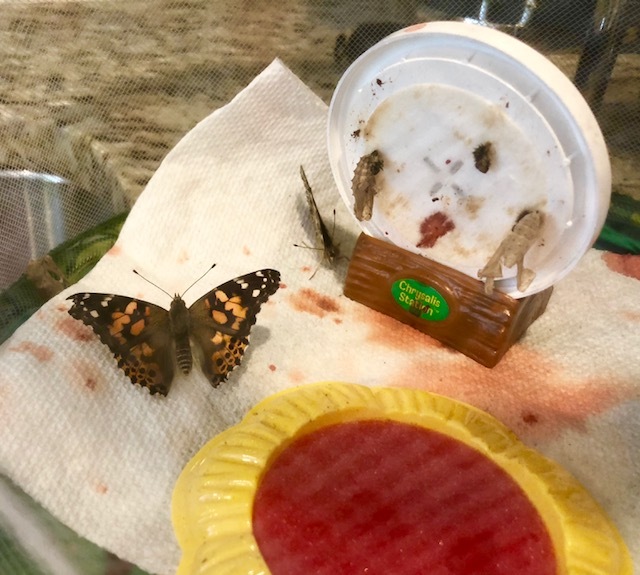 We laughed when a babysitter told us she'd heard a noise in the kitchen and thought someone was in the house; it was the butterflies, fluttering. And then, it was time to let them go. After Sabrina unzipped the top, just one flew out. I think we were all kind of hoping the others would stick around but of course, soon, they went too. We watched, happily, and life felt a little lighter. I stopped following the news after the Trump election...and after reading your summary of events this week I'm so glad I live in blissful ignorance of most news stories these days! I know. As much as I want to know what's going on locally and in the world, it is quite depressing, and there's no ignoring the news thx to iPhone and Facebook updates. The royal wedding was a breath of fresh air this weekend! Yes, butterflies can be noisy! Especially through quiet rooms or outdoors. Good you were able to raise them for some time and it was a great family activity. Hi, Adelaide! We're going to buy more caterpillars and do it again!